Starting Over Again...A Must See Film! As hubby will be home in time for summer, I am now in the midst of drawing up some activities that could keep us occupied during the most awaited time of the year. I knew that some people do not really enjoy summer because of the heat and to some, it brings a bit of discomfort especially when you stay in the heart of the city. But it is during summer that we could do a lot of bonding activities and traveling is one of our favorite activity. Apart from this, we also take the opportunity to look over the house and try to fix what needs to be fixed. Obviously we couldn't have constructions on going during the rainy season so anything that relates to home repairs should be done during this time. For our teen kids, it is the best time for them to bond and engage themselves with their hobbies. Biking would be a great outdoor activity and so with jogging, strolling in the park and swimming. Indoors, they normally watch movies and play guitar. My daughter normally loves to add up to what she already have and going a bit advance in terms of her musical whims and caprices would sometimes go into the scene. I hope that she would not think of buying a tc electronic flashback delay. Not only would it be too costly but I think this cannot really be of great use as they just normally get busy with their hobbies during summer. But on top of all those summer activities, I think that being united as a family and having fun together is the most important thing that we often look up to during summer. This is the time that we can be complete and free from our personal commitments. So for me, making plans for summer this early is a thing that shouldn't be neglected. I think it is very common for website owners to be relatively interested in understanding how SEO works. For one, SEO can be of great help in improving your page ranking and this is what most web masters are aiming for. As SEO is a simple technique to increase traffic, a large number of internet users rely on SEO in marketing their business. SEO is a complex thing to learn but you will reap the benefits once you are already there. There are many sources of traffic to your sites but the ones from search engines are the best ones as it helps you build community. Traffic driven from search engines are trusted and are considered credible sources of information, thus it is more likely for a reader to follow your site or subscribe to your feeds. This in turn, can assure you of regular traffic, thus increasing the probability of increasing your page ranking. Of course articles should be meaty and informative, otherwise no one will be interested to read it. The quality of your content is very important as it will greatly affect your Google standing. Many website owners however are not fully aware of how SEO works and for this reason, SEO advice is often sought from reliable and reputable companies. As this is a very delicate job and requires a considerable amount of time and knowledge, most website owners just rely on the expertise of those qualified personnel through outsourcing. Conducting keywords research, optimizing pages and building inbound links are only some of the things that webmasters need to master to increase the visibility of their websites to the search engines. As online marketing is getting more and more attractive and competitive, many companies are now lured to using SEO as an effective strategy so understanding how SEO works is as important as learning your ABC's. I used to mention that summer is my most favorite time of the year. It is during this season that I could engage myself in lots of activities that I consider productive and worthwhile. Gardening is one good example. I can always go out on a sunny morning to tender my garden and add more to my collection. The only problem that we would face though is the scarcity of water supply. This is especially true for those who are staying on the elevated grounds where water supply is really hard to get. Thanks God that we are in a low lying subdivision and water supply is not really a problem. Should it has been the case, I would be resorting to getting WeGotPumps.com water pump. I actually plan to go into vegetable gardening this time. I have lots of plants in our yard and garden but I have not really started a vegetable garden. This year, I am more determined to do this as I am now at home and could attend to my garden everyday or when needed. I have already started with few vegetable varieties and I'm thinking of acquiring more. How I wish I could do it really soon! I had the chance to watch this film right on the opening day (February 12) with my daughter. As I am now staying at home, my only "me time" is watching movies and going to spa. It's very seldom that I could find movies that I really want to watch on a big screen as normally me and my kids are just downloading movies from the internet for our weekend movie marathon. I was intrigued to watch this film though. I love Piolo as a dramatic actor. He got that special kind of charm when you watch him act and serve those heart breaking lines. I am not a fan of Toni though but the story as shown on trailer seemed to be interesting thus I asked my daughter if she wanted to watch the movie with me. I love the concept of the movie. The ending is my favorite. Normally, the main stars of the movie will end up together as "live happy ever after" kind of thing and this traditional ending never excites me anymore. On my mind, I was asking, "Do they always have to be together in the end?" But this film proved to be different. Toni and Piolo didn't ended up together but overall, the movie has a lot to offer in terms of lessons. If you watch the film, you will realize what love is really all about. It will make you realize how to value the people you love. But the greatest lesson that you will get here is "acceptance". Accepting things as they are and accepting that you can't bring back everything that you've lost. Letting go is the main theme of this film as it was shown here how to let go of things and people gracefully no matter how painful it is. It teaches us that we can't have everything we want in this world especially if it would mean hurting someone else on the process. Well, that's life. 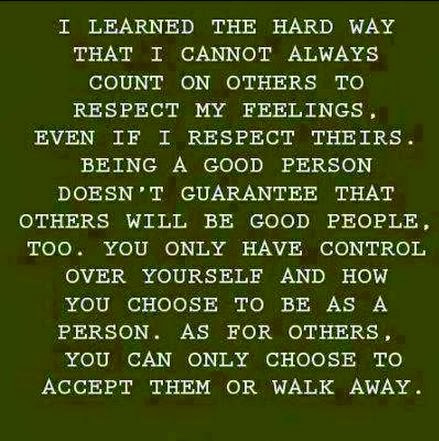 As this saying goes, you cannot always count on others to respect your feelings. Chances are there will be people who will show hostility towards you and worse than that will treat you badly no matter how you treat them right. We can't really please all people and we can't change them the way they are, so we are just left with a choice...to accept them or to leave them. It is simply saying that if we can't endure staying with people who can constantly bring us upset and bad feelings, then we always have the option to avoid them. I think that would keep you away from problems for the time being.